You are here: Home / Uncategorized / Happy Fourth! Happy Fourth of July from Little Man and me... oh yes, and Mr. Daisy, too! He was taking the picture of course! We are enjoying a lovely trip in San Diego. We took this picture just inside our incredible hotel. No we weren't celebrating with drinks at the bar--we just loved this festive "Happy Birthday, America!" display! 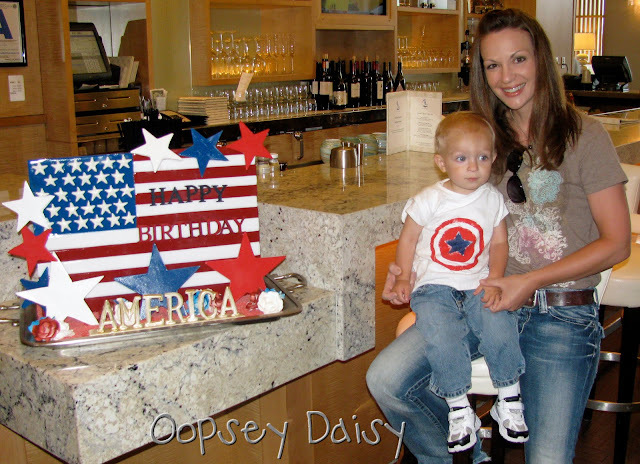 Remember this fabulous Captain American t-shirt from I Am Momma, Hear Me Roar! ? Well, I made my own version using a Wal-Mart muscle shirt, and that is what Little Man is wearing for this fun, festive day! He was standing in the window of our hotel on the 29th floor. Do we have a gorgeous view or what?! Anyway, I will be forever grateful that I live in this Land of the Free and Home of the Brave. There is just something about the stars and stripes that makes me feel so proud. Our country is great... thanks to the sacrifices and contributions of so many. I appreciate YOU, my wonderful readers. I hope you enjoy a yummy cook-out, some breath-taking fireworks, and lots of family fun!! You deserve it! Have a fabulous Fourth! Happy 4th of July to you as well! I hope you have a wonderful day! I love your little man's shirt! It turned out so adorable, you are going to have to keep all the girls away from him hehehe! What a great little display! The Captain America tee looks fab. I'm so going to try to make one of those next year for my little guy. And I was totally sporting that shirt you're wearing yesterday. ♥ Kohl's. 😉 We have great taste! lol! Happy 4th, my friend! Your vacation looks like it was fabulous! Happy 4th of July!!! Love the little muscle shirt- so cute! Great job with the Captain America tee and thanks SO much for sharing! Your little guy has the sweetest little face! Excellent work!